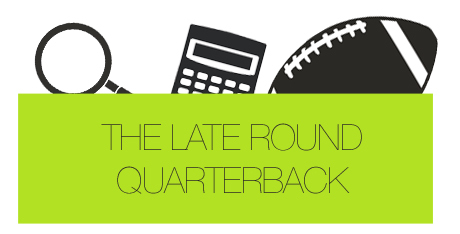 Back when we drafted our fantasy football teams in August, it was common to see at least five quarterbacks leave the board by the end of Round 2. Fantasy experts told you to do it. The game of football, with teams consistently moving to a pass-first, spread offense, told you to do it. And heck, the 2011 season alone told you to do it. I grimaced at the sight of Drew Brees joining a fantasy team at the end of the first round. The left side of my brain ached at the thought of drafting a quarterback early, as it was something that just didn’t make mathematical sense. I had no intention in drafting one before the 8th or 9th round because I like to make decisions based on true, sound probability. Coming into the 2012 season, one of the main reasons I felt so strongly about the Late Round Quarterback approach was because the 2011 NFL season featured some strange occurrences. There was a near lockout, first off, that handcuffed the preparation of team defenses. But just as importantly, from a stats standpoint, we saw things that we simply hadn’t seen before. And until I saw it more than just once, I wasn’t going to make it my norm. I was going to continue to draft my fantasy quarterbacks late. It’s up to you whether or not you believe the strategy is correct. One thing’s for certain, those five quarterbacks that were drafted so highly in 2012? Yeah, they definitely didn’t repeat their 2011 performances in 2012. If you were to use one word to describe Stafford’s 2012 fantasy campaign, it’d be inconsistent. The Lions’ quarterback finished 2011 with 333 fantasy points, and dropped to 263 in 2012. The 70-point swing should be alarming, especially considering Stafford played the entire season. Can we pinpoint a single reason as to why Stafford’s fantasy numbers dropped so significantly? Well, if we were to look solely at the stats, the number one reason was clearly touchdown passes. In 2011, 75% of Stafford’s 16 games resulted in two or more touchdown passes. This past season, Stafford threw for more than one touchdown in just 31% of his contests. There are, however, a couple of things going for Stafford. He only had two contests in 2012 under 11 standard fantasy points (now, I realize that’s still not all that impressive), and still had 7 games with 18 or more fantasy points. He’s got the best receiver in the game, and his targets throughout 2012 were nothing short of depressing. Titus Young didn’t live up to his pre-season hype, and Nate Burleson got injured early in the season. It would be frustrating for anyone if they had to constantly throw to the butterfingered Brandon Pettigrew. The number of pass attempts alone make Stafford a reasonable fantasy starter. Over the last two seasons, Stafford has thrown nearly 1,400 passes. Terry Bradshaw didn’t get to that number until his sixth season. Considering the depth at the quarterback position in 2013, he could be an absolute steal late in your draft. One thing that I’m fixing throughout my analyses – let’s call it a New Year’s Resolution – is having any sort of reliance on averages. Cam Newton is one of the reasons I have to do this. The beginning of the 2012 season was somewhat abysmal for Newton owners because they had no idea what they were getting from him each week. He had two single-digit fantasy performances over his first five weeks, including two games with a goose egg in the touchdown column. To put that into perspective, Cam never scored less than 11 fantasy points in 2011. After the Panthers’ Week 5 bye, however, Cam certainly turned it on. In fact, 36% of Newton’s performances from Week 7 through Week 16 resulted in 20-plus fantasy points. His legs had a lot to do with that, as he threw for three touchdown passes in just one game this season. So why can’t we look at his average points per game and conclude that he was the fourth best fantasy option at quarterback this season? Because Newton’s performances were top-heavy. He had three separate 30-plus point performances. When you’re playing fantasy football, a weekly game, 35 points from one position, at times, is just as good as 75 points. What matters more is getting 35 points every single week to continuously yield an advantage at that position. That’s what Cam didn’t do. While his numbers were better in the second half of the season, he still posted four more additional games of 15 or fewer fantasy points. If we add that to the beginning of the season, nearly 38% of Cam Newton’s games in 2012 resulted in fantasy scores of 15 or less. On a weekly basis, that would hover around the 15th or 16th best fantasy option at the position. His legs kept him relevant to fantasy football, which was the case, for the most part, in 2011. He had 14 rushing touchdowns during his rookie season, and that dropped to 8 during his sophomore work. The difference, 6 touchdowns, equates to 36 fantasy points. Imagine that – Newton had a 43-point differential from 2011 to 2012. Could it be from his reliance on rushing touchdowns? It’s not going to surprise me when someone reaches for Carolina’s signal caller in 2013. I fully expect him to continue to be a moderate passer from a fantasy standpoint, but to push himself over the mediocre edge with his running ability. The problem I foresee is if he ever has a season with, say, 3 or 4 rushing touchdowns, his fantasy value plummets. It may seem like such a minute difference in his numbers, but 30 to 40 fantasy points is what separates him from being a cumulative elite quarterback to being one in the same tier as Tony Romo. While the NFL has seen a new wave of running quarterbacks, the idea itself scares me from a fantasy point of view. I’d rather wait and take a quarterback who’s going to throw the ball 600-plus times, like Andrew Luck or Matthew Stafford. No quarterback in the history of the NFL threw for more yards than Drew Brees did in 2011. If you add up Russell Wilson and Robert Griffin III’s passing yardage totals for 2012, they were just 842 greater than Brees’ 2011 total. Insane. And Brees did some spectacular things in 2012, too. He threw for over 5,000 yards again, and led all fantasy quarterbacks with 337 standard fantasy points. His season still, however, didn’t even come close to his 2011 one. In 2011, it was normal for Brees to have a 20-point performance. He scored 20 or more fantasy points in 75% of his games, and had 25 or more in nearly half of them. While reading that, if your mind hasn’t said “That’s insane!”, then just wait for Aaron Rodgers’ numbers below. The 2012 season told a different story for Brees, even though he was the top quarterback scorer. The number of 20-plus point performance dropped from 12 to 9, and he failed to reach 15 points in three of his games. However, aside from his fart against the Falcons, Brees had the most consistently good season of any fantasy quarterback outside of Brady. When you draft Brees over Brady and Rodgers, you do it because you know he’ll probably end up throwing the most of the three. He’ll throw more picks, but he’ll throw for more yardage. That’s the way it is. There’s no reason to rank him outside of the top-3 at the quarterback position in 2013. He’s proven to be one of the most consistent quarterbacks in fantasy, and there’s no sign of that stopping. Just keep in mind that a 5,000-yard season should never become typical. I understand that quarterbacks are passing more than they ever have, but there’s a ceiling that will become inevitable in the NFL. When there’s only a certain amount of offensive plays per game, there are only so many opportunities to throw the football. And even if an offense is throwing the ball during 80% of their offensive plays, that’s still not going to yield many more pass attempts than what’s happening in today’s NFL. Of course something like a constant hurry-up offense can change this fact, but I’d be unbelievably surprised if we ever saw a 6,000-yard season given time constraints. And given these constraints, we shouldn’t assume Brees could just continue at this pace, even though it’s expected. New England’s quarterback finished as the second highest scoring fantasy quarterback in 2012 after another solid season. But, just like the rest of them, Brady’s numbers in 2012 pale in comparison to his 2011 season. Two seasons ago, Tom Brady had one performance under 15 fantasy points. It was against the Jets – Week 5 of 2011 – and he threw for just one touchdown. He scored 14 fantasy points. It was one of two games where Brady threw just a single touchdown in a game. Every other one in 2011 yielded a two-plus touchdown performance. Fast-forward to this past season, and you’ll see that Brady’s tale was a little different. He had five games with just a single touchdown pass, and three with fewer than 15 fantasy points. Brady scored more than 20 points five times in 2012 after doing it nine times in 2011. Clearly, the season was worse. Even though Brady scored fewer fantasy points in 2012 than Drew Brees, I consider his season as the best of any quarterback in fantasy. And the reason is simple: Week-to-week consistency. While everyone seemed to be consistent in 2011, Brady seemed to be the only one who could continue the success in 2012. He was reliable – more reliable than any other guy in the fake sport. He never had fewer than 11 fantasy points, and had a median fantasy score of 18. Brady was so consistent that, if you were to remove his two best games from a fantasy output perspective, his average per game dropped only by a point. Even with that, it’s obvious that his 2012 performance wasn’t as good as his 2011 one. It could be attributed to the success of the New England running game, but given the rest of the “elite” fantasy and NFL quarterbacks, Brady seems to simply fit the 2011-anomaly mold. Brady, in my eyes, should be the top ranked quarterback moving into 2013. Gronkowski will be back and hopefully healthy for the entire season, and the run game should keep the offense more balanced than what Brees and Rodgers have on their respective teams. Just like Brees, we shouldn’t make assumptions and create higher benchmarks for Brady. There are time constraints in each NFL game (60 minutes), and only so many passes can be attempted. Brady, though, has the best shot to put up monster numbers given his weapons. To many, Aaron Rodgers was the undisputed first overall fantasy pick for 2012. Clearly I said otherwise, but my reach only goes so far. I was in many, many fantasy drafts this year where Rodgers was selected with the first overall pick. I bet they regret that. But really, if anyone believed Rodgers would repeat his 2011 season, they should have drafted him with the top pick. His numbers were absurd. He finished as the top scorer with 385 standard fantasy points (according to ESPN’s non-decimal scoring), and he played in just 15 games. Let’s break this down a bit for some perspective. Rodgers threw the ball just 502 times in 2011. Brees threw it 657 times, and Brady had 611 attempts. Heck, even Cam Newton had more pass attempts than Aaron Rodgers in 2011. What this means is that Rodgers averaged an absurd .77 fantasy points per pass attempt in 2011. Brees and Brady averaged .58, and Cam’s number was at .68. If Rodgers would have thrown the ball as much as Brees in 2011, given his average per pass attempt, he would have finished with over 505 fantasy points. Aaron Rodgers’ efficiency in 2011 was through the roof good. It was ridiculous. And it was so good that in order to repeat it, Rodgers would have to continue to play at a level that no quarterback has ever played at. Why bank on that? His 2012 season was obviously not the same, and it’s not surprising that it wasn’t, either. Rodgers had just one game under 20 fantasy points in 2011. One. The standard stat line for a 20-point fantasy performance is 300 passing yards, two touchdowns and zero interceptions. Rodgers had comparable performances in all but one game in 2011. In 2012, Rodgers failed to reach 20 points in 7 of his 16 (44%) games. That’s a significant jump from just 1 of his 15 (6.67%) games in 2011. And moreover, each of those 7 games in 2012 featured a score of 15 or fewer fantasy points. Again, the number 15 is typically one that would be outside the top-15 in a given 2012 week. In other words, 44% of Aaron Rodgers’ 2012 campaign resulted in games where he was being outscored by waiver wire plays. I attribute Rodgers’ dip in production to a couple of things. First, like the rest of the quarterbacks, it’s very difficult to replicate historical greatness. We saw unbelievable effectiveness in 2011, and assumed it could be replicated in 2012. Second, Rodgers had a carousel of offensive personnel throughout the season. Greg Jennings was hurt, then Jordy Nelson was out, and the team had no consistency at running back. You can’t expect insane numbers from a quarterback with so much changing. Even so, I think 2012 showed us that drafting a quarterback that high is a bad idea. We all have to temper expectations when we see something great occur. For something like Aaron Rodgers’ 2011 season to be duplicated, many things need to go the right way. That just doesn’t happen. Rodgers, Brady and Brees will all be top quarterbacks again moving into 2013. I mentioned above that I like Brady the most, but I do believe that Rodgers is the most efficient of the three quarterbacks. He does the most with the least number of pass attempts. Greg Jennings should be gone, and Jordy Nelson should be healthy. The emergence of Randall Cobb should help Rodgers’ value, too. But until the Packers get a legitimate running game, Rodgers is going to struggle to find his 2011 form. The 2012 season should have taught you not to overreact when you see something once in sports. The elite quarterbacks of 2011 surely separated themselves from the rest of the pack. It was the first time we’d ever seen such a division between the best at the position to the rest. And because of this, many fantasy football owners drafted a quarterback at an inflated price. What happened in 2012 was normal. Yes, the league is becoming more pass-friendly. And yes, we’re still seeing some ludicrous stat lines. But we’re seeing it with more quarterbacks than just the elite ones. The rookie class (Andrew Luck, Robert Griffin III, Russell Wilson), veteran quarterbacks (Peyton Manning, Matt Ryan) and even second-year signal callers (Andy Dalton) are making the elite options at quarterback replaceable from a week to week basis. 2011, a season with a near-lockout, separated some of the pass-first offenses because defenses weren’t prepared. They couldn’t keep up. Let’s face it: The fantasy quarterback class in 2013 is going to be deeper than it’s ever been. When you start just one quarterback on your fantasy football team, you see less variance from player to player. When a quarterback like Tony Romo – one that has historically been a good fantasy play – will potentially be the 10th or 11th quarterback off the board, you know you can wait. You know you can afford to stock up on running backs and receivers in the early rounds of your draft. The Late Round Quarterback philosophy, based on supply and demand, math and logic will be in full force entering 2013. And it’s because the rest of the league is catching up to the 2011 elite quarterbacks listed above.